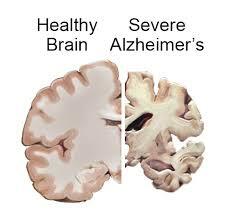 Although the proteins responsible are found in healthy brains, in Alzheimer's they are misfolded and stick together. Why these proteins, called amyloid-beta and tau, should behave in this way is not understood. Previous research has identified that certain areas of the brain are more sensitive to the aggregation of proteins. The disease often begins in the entorhinal region (at the base of the brain) and spreads out to all of the neocortex (the largest part of the cerebral cortex). A study published this week in Science Advances set out to understand why certain areas of the brain are more susceptible to the build-up of plaques and tangles. The researchers hope that by understanding why specific regions are more prone to attack, they might have a better understanding of the molecular processes that underpin it. "We wanted to know whether there is something special about the way these proteins behave in vulnerable brain tissue in young individuals, long before the typical age of onset of the disease." The team analyzed more than 500 samples of healthy brain tissue taken from the Allen Brain Atlas. In the healthy tissue, they spotted a signature produced by a group of genes involved in the control of amyloid-beta and tau. In healthy brains, there are a number of mechanisms that help prevent and clear up abnormal protein aggregation; they are referred to as protein homeostasis mechanisms. As we age, these mechanisms are less effective; this allows proteins to start building up, particularly in areas where protein management was already weaker. The team effectively charted the weak spots of protein homeostasis in healthy brains and found that they matched up neatly with the progression of Alzheimer's disease. Co-author Prof. Christopher Dobson says: "Linking the properties of specific protein molecules to the onset and spread of neuronal damage is a crucial step in the quest to find effective drugs to combat this dreadful neurodegenerative condition." Prof. Vendruscolo hopes that the findings will prompt further research into protein control systems and that, in the future, "we may become capable of helping our brains age more healthily." Earlier in the year, the same team of investigators wrote about the possibility of "neurostatins." They predict that, in the future, in the same way that statins are taken to prevent heart disease, theoretical neurostatins could be taken to stop or at least slow Alzheimer's progression. Of course, a wonder drug that prevents Alzheimer's is, unfortunately, some way off. But in the shorter term, the findings of the present study have the potential to assist in the research effort. Currently, one of the hindrances to Alzheimer's research is the lack of an animal model. Models of disease are an essential tool in the study of poorly understood diseases. Because Alzheimer's molecular origins are a mystery, it has been difficult to replicate in animals. Additionally, the findings might prove beneficial for the research of other conditions. Rosie Freer, a Ph.D. student in the Department of Chemistry and lead author of the study, says: "It is exciting to consider that the molecular origins identified here for Alzheimer's disease may predict vulnerability for other diseases associated with aberrant aggregation - such as ALS, Parkinson's disease, and frontotemporal dementia."